Ok, first things first: today’s one-day fast has nothing to do with weight loss, “cleansing,” or purging. Last night, somewhere around nine o’clock, I found myself elbow deep into a box of cereal. It wasn’t the late night snacking that caught my attention–it was the fact that I was almost entirely unaware of what I was doing. It was the epitome of mindless action. In my reckoning, Thoreau’s exhortation, “Instead of three meals a day, if it be necessary eat but one” is not a Transcendentalist weight loss plan, an admission of anorexia, or a monastic call to austerity. Rather, I think he is asking us to attune to our own hunger. If food is one of our most basic needs, then hunger can provide a tool for living deliberately: to eat when I hear the call of its necessity. Trust me: I love food, and food for me is not just sustenance. Food connects me to my past. It connects me to my family. When I cook for you, or with you, it is an act of love. I guess I could have just said “I’m Italian” and you would have understood, right? So the idea here is not to deny myself food. Rather, I’m trying to create a space, for today, to become aware of all the times when I am eating food not because of its necessity, or because it is providing some other level of nourishment, but simply as a mindless act. So this morning I caught myself not popping the cantaloupe cube into my mouth, that had not quite made it into one of the kids’ snack packs. I also was aware of not licking the last of the chicken salad off the knife, and not nibbling on a pita chip right before I sealed up the bag to put it back in the well-provided pantry. Not a bad start. It was only on the drive to work, when I found myself sucking on a Fisherman’s Friend lozenge, did I realize–Hey wait! I’m eating! Even though there’s an argument to be made that a lozenge might be more candy than medicine (did you know Pez distributes Fisherman’s Friend?) given how bad I have been coughing lately, I decided they were indeed a necessity today. But the fact that I had popped one in my mouth without even realizing it, while caught up in God-knows-what distracting train of thought, was in itself instructive. In fact, if I’m really honest about it, I couldn’t tell you if it was the first or second lozenge I was sucking on when I became aware of what I was doing. I definitely felt a growing sense of focus as the day went on. 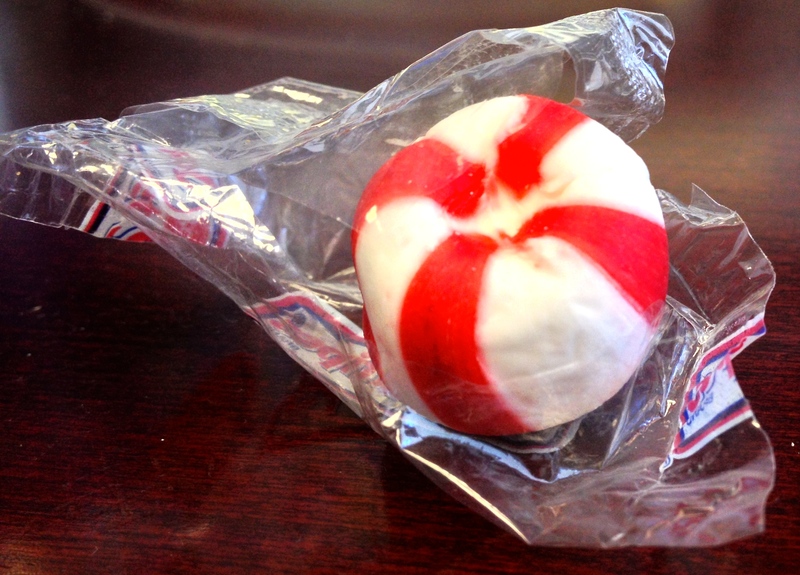 In the middle of a phone call with one of our VP’s, I realized that I had unwrapped a peppermint candy that had been sitting on my desk and was getting ready to pop in it my mouth. Entirely unaware of my own actions! By 3pm, I realized that I was feeling hungry…pretty much for the first time today. Feeling hunger all the time is undoubtedly a basic condition of human suffering that is far too common for far too many people around the world. Never feeling hungry, however, seems perhaps equally unjust. As I was pulling in front of my house, I caught myself thinking about what snack I could put together while I prepared dinner. I don’t think it was because I was hungry: I think it was simply because I was pulling in front of my house, and that’s what I do when I first walk in the door. I parked the car, started walking down the path toward the front door and caught myself thinking the same thought–only moments after acknowledging how rote my thoughts and actions can be! It’s about 5:30pm now–the time I would usually start cooking. I remembered, though, that my wife promised the kids dinner out at a local joint specializing in corn dogs and fountain drinks. Not exactly the most tempting meal for me to skip, I have to admit. And tomorrow’s first act: a mindful, deliberate breakfast! This entry was posted in Uncategorized and tagged food, heeding, mindfulness, necessity, simplify, Thoreau. Bookmark the permalink.